By some wonderful twist of fate, the creative team of writer John Arcudi, artist James Harren, and colorist Dave Stewart is releasing four issues of new material in the span of two months. It’s a rare enough occurrence to get monthly content from James Harren—whose meticulous work requires quite a bit of lead time—so to have him putting out two issues a month for two months straight is an astonishing feat. This Wednesday sees the release of Dark Horse’s B.P.R.D. #127 (co-written by Mike Mignola) and Image’s Rumble #2, two titles that feature gritty urban environments, fantastical monsters, and dynamic action, but have drastically different tones. (For more on that, check out this “Big Issues” from last month.) 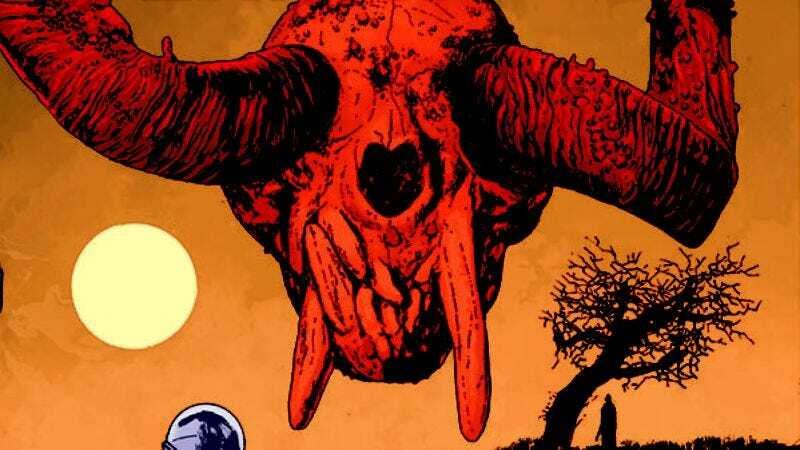 While Rumble incorporates a dark sense of humor into its story, B.P.R.D. takes a much bleaker approach, painting a somber picture of a world struggling to survive after Armageddon. This preview of B.P.R.D. #127 spotlights that seriousness as two agents make their way back to the rest of their squad two days after a devastating monster attack, a reunion depicted with a cold, stark visual style that doesn’t suggest things are getting any better now that the group is back together. It’s a chilly start to the issue, which intensifies as it delves into the events of those two days, as well as how the team’s current situation ties into Agent Howards’ past experience as a prehistoric warlord. Unlike the expansive previous two chapters in this arc, this week’s issue narrows the focus to look at how two characters deal with these horrific circumstances, making it a powerful spotlight for Agent Howards specifically. B.P.R.D. is Dark Horse’s longest-running ongoing series, and thanks to the synergy of the creative team, it’s still going strong after over a decade’s worth of stories.